Add a streamlined look to your hanging decorations with the Panacea Contemporary Swivel Plant Bracket. This bracket features a gentle arch upward, finishing with a small inward curve. The generous 12.5" long arm holds hanging baskets, bird feeders, or outdoor lanterns up to 24" in diameter. Mount the included bracket on a wall or post and insert the hanger into it. 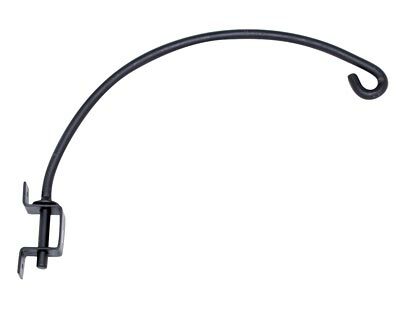 This bracket allows the hanger to swing 180° horizontally, so you can place your favorite feeder in the perfect viewing spot, or ensure that your hanging basket receives an adequate amount of sunlight. The hanger is crafted from a round rod for a seamless look, and the hardened steel construction will certainly last for several seasons. The black finish lends a timeless air to the item. Use the two included screws to mount this bracket to a wall or post. Blend classic garden accents with modern style using this Contemporary Swivel Plant Bracket.